The biggest complaint from our customers about the eclipse tooling for B*MS is that the cost of entry is too high; not only must a user be familiar with several different technologies, such as Git, maven, REST services and how these technologies are exposed by the eclipse tooling, but s/he must also understand the various Drools and jBPM configuration and definition files. Since there are only a few user-friendly/graphical editors that hide underlying file details, the user must become familiar with most of these file formats, and where in the Project or Repository hierarchy the file resides. One of the enhancements I have been working on will hopefully ease some of this burden by providing a "navigator" similar to the Eclipse Project Explorer, but designed specifically for Drools/jBPM projects (see below). At the root of this tree viewer are the app servers that have Drools/jBPM installed. 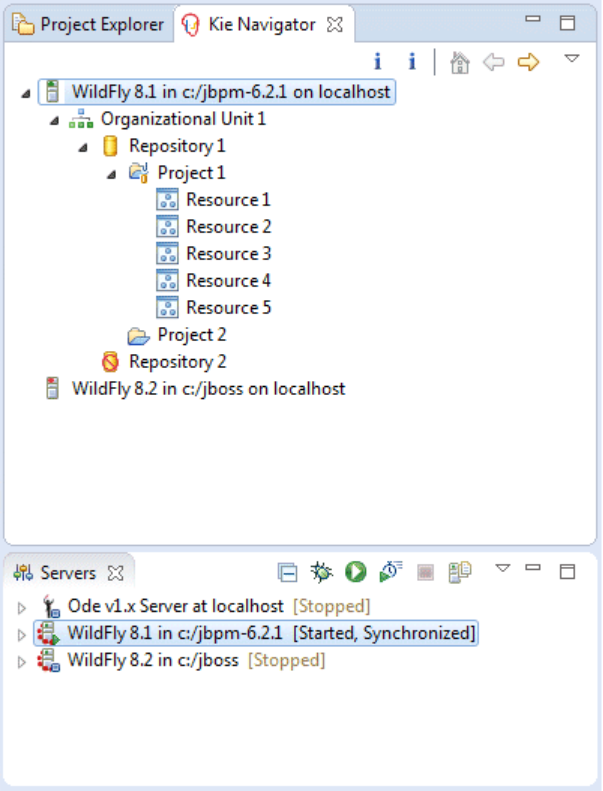 Servers are managed (start, stop, debug) from the WST Servers view. At the next level is the Organizational Unit, then Repositories and finally Projects. Essentially, this viewer mimics the web console with the addition of multiple servers. The tree structure is cached whenever a connection to the server can be established. This allows the view to be used in "offline" mode if the server is down or network connection is unavailable. When the server is available again, the viewer synchronizes its cache with the server. Repositories are automatically cloned, and Projects are imported as they are requested by the user with a context menu action. I'm still in the design/experimenting phase right now, so if there's a feature you'd like to see, or if you have suggestions for improving this interface please post your comments here. You can also see a related post, showing my work on improving the wizards and runtime generation and configuration.